To Cite: Lee H, Lee I J. Assessment of Independent Risk Factors of Developing Pneumothorax During Percutaneous Core Needle Lung Biopsy: Focus on Lesion Depth, Iran J Radiol. 2016 ; 13(4):e30929. doi: 10.5812/iranjradiol.30929. Background: Previous studies identifying risk factors for pneumothorax in percutaneous core needle lung biopsies reported inconsistent and contradictory results. Objectives: We aimed to identify independent risk factors for pneumothorax associated with computed tomography (CT)-guided percutaneous core needle lung biopsy (PCNB). Patients and Methods: We retrospectively reviewed 591 biopsy procedures for focal lung lesions. Risk factors for pneumothorax as a complication after lung biopsy were determined by univariate and multivariate analyses of variables including the patient’s age, gender, lesion depth from the pleural surface, lesion size, lesion location, presence or absence of fissure crossing by the needle, emphysema in the same lobe where the biopsy was performed, and the final diagnosis of the biopsy lesion. Results: Pneumothorax occurred in 100 (16.9%) of 591 procedures. Based on univariate analyses, significant risk factors affecting the incidence of pneumothorax were patient gender (P = 0.039), lesion depth from the pleural surface (P < 0.001), fissure crossing by the needle (P = 0.002), and the presence of emphysema (P = 0.009). From the multivariate analysis, an increased rate of pneumothorax was strongly correlated with lesion depth from the pleural surface (odds ratio [OR], 1.71; 95% confidence interval [CI], 1.50 - 1.96; P < 0.001) and the presence of emphysema (OR, 2.95; 95% CI, 1.73 - 5.04; P < 0.001). Conclusion: Lesion depth from the pleural surface and the presence of emphysema were strongly correlated with the increasing incidence of pneumothorax after CT-guided PCNB. Our results may be applicable for the risk management of PCNBs to reduce pneumothorax as a complication. Computed tomography (CT)-guided percutaneous needle lung biopsy (PCNB) is a well-established and safe method utilized in the diagnosis of pulmonary lesions requiring pathological confirmation (1, 2). Although CT-guided PCNB is generally safe, however, pneumothorax is a relatively well-known complication of this procedure (3, 4). In prior studies, there have been efforts to identify the risk factors of pneumothorax in CT-guided PCNB, but the results have been inconsistent and contradictory. Although no scientific explanation is known for the differences between these study results, all prior reported studies had small population sizes or relied upon biopsies performed by different radiologists with varied levels of experience, which could have affected the rate of complication. In this report, we determined the independent risk factors of pneumothorax after CT-guided PCNB by performing a retrospective review of 591 consecutive CT-guided PCNBs using a core needle. 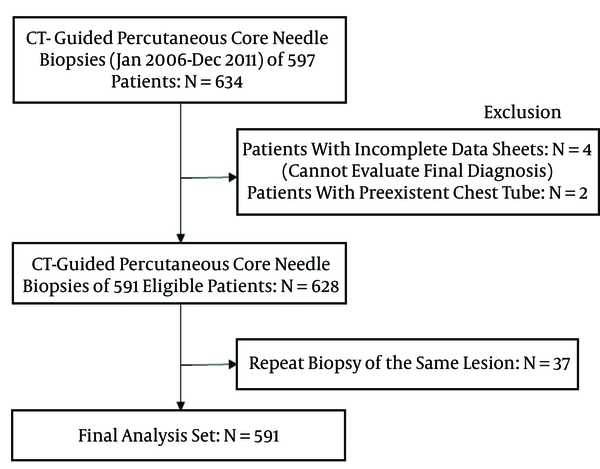 From January 2006 through December 2011, 634 CT-guided percutaneous core needle biopsies that were consecutively collected using an automated biopsy gun on 597 patients were studied. All patients referred for PCNB had focal pulmonary lesions presenting as nodule, mass, or focal consolidations. Six biopsies performed on patients with incomplete data sheets (n = 4) or preexistent chest tubes (n = 2) were excluded from the study. In 37 patients, histopathologic results from the first CT-guided lung biopsy showed no malignancy, but a second biopsy of the same lesion was performed within one week because malignancy was suspected, based on the subsequent clinical course. Any second biopsies (n = 37) of the same lesion were excluded from the study’s evaluation of complications. Finally, the samples came from 591 focal lung lesions in 591 patients, and patient data were subjected to statistical analysis to determine pneumothorax risk factors (Figure 1). Informed consent was obtained from all patients prior to participation. All cases of CT-guided PCNB were retrospectively reviewed under consent in accordance with institutional review board-approved protocols. A chest radiologist with 10 years of PCNB experience performed all PCNBs. All patients underwent a diagnostic chest CT or positron emission tomography(PET)-CT scan prior to the procedure. All PCNBs were performed using CT (Hispeed, GE Medical Systems; MX 8000 IDT, Philips Medical Systems) for image guidance. The biopsy tool was an automated biopsy gun (Magnum®, Bard) with an 18-gauge needle. If possible, passage of the needle through the fissure during biopsy was avoided. To increase the accuracy of the diagnosis, the number of needle passes was held to two per case for all PCNBs. If the first passage of the needle failed, one more passage of the needle was attempted to biopsy the lung tissue. Passage of the needle for the biopsy was thus attempted a total of two times. There was no case that included two failed attempts to obtain the specimen. All patients were monitored for possible complications, including pneumothorax and hemoptysis. Erect posteroanterior expiratory chest radiographs were obtained two hours after PCNB and the next morning in order to monitor the development of potential pneumothorax. Pneumothorax with a large amount or symptoms was treated with the insertion of a pig-tail catheter or a chest tube. Other cases of pneumothorax were managed with close observation and oxygen inhalation. The patient’s age and gender, lesion depth from the pleural surface, lesion size and lobe of the lesion location, fissure crossing during biopsy, the presence of emphysema in the same lobe where the biopsy was performed, and the final diagnosis of the biopsy lesion were recorded. Lesion depth from the pleural surface was measured from the point of pleural puncture to the nearest edge of the lung lesion along the needle path, which means the distance of aerated lung passed through the biopsy needle, using a lung window setting (Figure 2). The puncture site of the pleura and the pathway were selected as the smallest distance from the lesion to the pleura as possible, based on the subjective ease of approach on the CT. Lesion size was measured along the maximum long-axis diameter on a horizontal CT section. The lobe of the lesion location was classified as the upper, middle, or lower lobe. Fissure crossing by the needle was defined as the passage of the needle through the fissure on a lung window display. The presence of emphysema was defined as the presence of deteriorated lung tissue, such as emphysema or bullae, in the lobe selected for biopsy on the basis of the CT results alone. A final diagnosis was rendered and analyzed with subsequent follow-up data on the basis of clinical and imaging follow-up, and a review of medical records extending at least 24 months after the PCNB was also performed. Electronic medical records were reviewed for occurrences of pneumothorax on follow-up chest radiographs or during patient hospitalization, secondary to biopsy complications and final diagnosis (a combination of the clinical and pathologic information) of the biopsy lesion. Figure 2. A 65-year-old woman with a pulmonary nodule in the left upper lobe diagnosed by CT-guided thoracic biopsy. Lesion depth was measured from the point of pleural puncture to the nearest edge of the lung lesion along the needle path (distance a to b), which was 3.6 cm. The pathologic result was primary adenocarcinoma. Statistical analysis was performed using a statistics software package (SPSS; SPSS Inc.). Select variables described above were analyzed in order to determine their association with pneumothorax. The statistical significance was calculated from the mean of continuous variables (patient’s age, lesion depth, and lesion size) and was analyzed using Student’s t-test. Categorized variables (gender, lesion location, fissure crossing, emphysema, and final diagnosis) were analyzed using the χ2 test. The statistically significant factors at P < 0.05 for pneumothorax derived from the univariate analysis were selected for multivariate analysis, using multiple logistic regression. Multicollinearity (interaction between related factors) was analyzed for apparent insignificant factors with P > 0.05, using multiple logistic regression. Only variables significant in multiple logistic regression were considered independent risk factors and an odds ratio (OR) greater than 1.00 indicated a higher risk for the occurrence of pneumothorax as a complication of CT-guided PCNB. The patients were comprised of 397 men (67.2%) and 194 women (32.8%), with a mean age of 64.25 years (range, 18 - 89 years). Mean lesion depth from the pleural surface was 1.5 cm (range, 0 - 8.1 cm). Mean lesion size was 3.71 cm (range, 0.5 - 12.5 cm). The complications that occurred with the CT-guided percutaneous core needle lung biopsy were pneumothorax, pulmonary bleeding, and soft tissue hematoma; the results are listed in Table 1. Pneumothorax occurred in 100 (16.9%) of 591 patients who underwent CT-guided core needle biopsy. Treatment of pneumothorax by pig-tail catheter or chest tube insertion was needed in 24 (24%) of 100 cases of pneumothorax (4.1% of all biopsies). The relationships between pneumothorax and the patient’s age, gender, lesion depth from the pleural surface, lesion size, lesion location, fissure crossing by the needle, the presence of emphysema, and the final diagnosis are shown in Table 2. From initial univariate analyses, significant risk factors affecting the incidence of pneumothorax were patient gender (P = 0.039), lesion depth from the pleural surface (P < 0.001), fissure crossing by the needle (P = 0.002), and the presence of emphysema (P = 0.009). No significant correlation was found between age (P = 0.814), lesion size (P = 0.056), lesion location (P = 0.368) and the final diagnosis of the lesion (P = 0.691), with pneumothorax occurrence. Abbreviations: LLL, left lower lobe; LUL: left upper lobe; RLL, right lower lobe; RML, right middle lobe; RUL, right upper lobe. bDetermined with the Student’s t-test. cDetermined with the two-tailed Pearson’s χ2 test. Statistically significant factors for pneumothorax derived from univariate analyses were patient gender, lesion depth from the pleural surface, needle crossing of a fissure, and the presence of emphysema; these were selected for multivariate analysis using multiple logistic regression. R-squared of the multivariate regression model is 0.144. The results of multivariate analysis are shown in Table 3. Through multivariate analysis, an increased rate of pneumothorax was strongly correlated with the increasing distance of the lesion from the pleural surface (odds ratio [OR], 1.71; 95% confidence interval [CI], 1.50 - 1.96; P < 0.001) and the presence of emphysema in the same lobe where the biopsy was performed (OR, 2.95; 95% CI, 1.73 - 5.04; P < 0.001). aP < 0.05 was significant. bThe lowest OR in the group has the lowest risk ratio of 1.0.
cThe reference group has the lowest risk. Pneumothorax is a well-known complication of CT-guided PCNB (3, 4). The incidences of pneumothorax (16.9%) and pigtail-catheter or chest-tube insertion (24%) for pneumothorax management with the use of CT-guided core needle biopsy in our study were within the ranges reported in prior studies (4-25). Our study showed significant associations between patient gender, lesion depth from the pleural surface, needle crossing of a fissure, the presence of emphysema, and the rate of pneumothorax, based on univariate analysis. However, gender and needle crossing of a fissure were found to be insignificant when subjected to multivariate analysis. 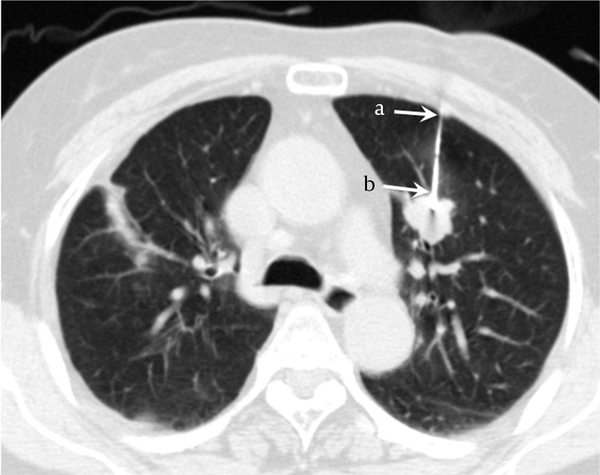 Only greater lesion depth and the presence of emphysema were independent risk factors of pneumothorax after CT-guided percutaneous core needle lung biopsy. Although the importance of lesion size, lesion location, needle crossing of a fissure, and the final diagnosis were previously considered to be important factors of pneumothorax, these factors were not found to be predictors in this study (4-25). Some prior investigations (5, 7-14) have reported that a longer distance of needle penetration between the point of pleural puncture and the edge of the lesion is associated with a higher rate of pneumothorax. On the other hand, other investigations (2, 16) contradicted the correlation between pneumothorax and lesion depth from the pleura. Although no scientific explanation is known for the difference in the prior reported study, small population sizes with less than 200 biopsy procedures included in prior studies, except that of Yeow et al. who included 660 biopsy procedures, could affect their rate of complication (16). Compared with studies based on large population sizes, our finding of a further increase in pneumothorax rate with increasing lesion depth from the pleural surface was not in accordance with the results obtained by Yeow et al. who reported that subpleural lesions that were between 0.1 and 2.0 cm from the pleural surface correlated with a higher pneumothorax rate than those further from the pleura (16). The reason for the contradictory results obtained by Yeow might be the varied experience levels of different radiologists, which could affect the complication rate included in Yeow’s results (16). Ohno et al. thought that a longer needle path might increase the chance of tearing the pleura and normal lung tissue as a patient breathes during the procedure (25). And Hiraki et al. proposed that the deeper the lesion, the greater the difficulty would be in maneuvering the needle into the lesion. Thus, more redirection of the needle may be required, which could result in greater tearing of the pleura and a longer procedure time (14). We also proposed that the crossing of additional tissue planes during deeper penetration, in addition to the decreased stability of the needle due to respiration, creates movement at the fulcrum or point of entry into the thorax. According to the results of most previous studies, the presence of obstructive airway disease was a common risk factor for the occurrence of pneumothorax (7-10, 18, 21, 22, 25). On the other hand, Takao et al. and Yeow et al. (14-16) contradicted the correlation between pneumothorax and the presence of emphysema. We found a significantly higher risk of pneumothorax in patients with emphysema (24.3% vs. 14.7% in patients without emphysema). Although the mechanism remains unclear, we propose that penetration of the emphysematous lung parenchyma or bullae by the biopsy needle and the increased airway pressure evident in emphysema affects air leakage from the lungs. This is a retrospective study and is therefore limited by the patients who have already been selected to undergo biopsies. In addition, the presence of emphysema was only evaluated on the basis of CT results alone; pulmonary function was not evaluated in risk analyses because a pulmonary function test is not usually performed before lung biopsy at our institution. Despite these limitations, our results represent a large population. A chest radiologist performed all PCNBs during routine clinical practice, which excluded the influence of individual radiologists’ preferences regarding needle path and needle size, based on their varying expertise levels. In conclusion, in CT-guided percutaneous core needle lung biopsies using an automated gun, lesion depth and emphysema were strongly correlated with the risk of pneumothorax. Our results may be applicable for risk management of CT-guided core needle lung biopsies to reduce pneumothorax as a complication. Authors’ Contribution: Ha-Yeon Lee: data review, statistical evaluation, collection of references, writing and correction of manuscript. In Jae Lee: study planning, data collection, writing and correction of manuscript.